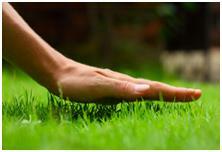 You probably know how the root system of your lawn plays a very important role in the life of your grass. Like all plants, the root system in grass absorbs the minerals and water needed for survival. What you probably do not know is that it sends hormonal signals to the aboveground portion of the grass, and it stores nutrition for later use. Put in simpler terms, in lawn care, roots are paramount. The deeper they are, the better. Want to know, how to optimally manage the root system of your lawn grass? Then learn about the factors that determine your lawn’s appearance, through the hot summer months. Contrary to common knowledge, watering too often can result in shallow root systems, and cause your lawn to die under severe heat stress periods. To have a deeper root system, watering your lawn deeply and then leave it for a brief moisture stress period. It is no rocket science, the deeper your roots are, the more likely your lawn will survive such heat stresses as well as the dry winter months. Mowing is another factor that affects root growth. You must wondering, is not that what everyone do? “Mow their lawn,” why it is an important factor? Wait! There is a catch, the higher the mowing height, the more green tissue there is to catch sunlight, which increases the root mass and root depth. So now you know, what to do the next time, you mow your lawn. Remember, a lower mowing height reduces the ability of the grass to absorb sunlight, which in turn lowers the production of nutrients and results in a shallower root system. Taller grass also helps to retain moisture in the soil by keeping the sun off the soil and the blades shade each other. You need to know how much fertilizer is appropriate for grass rooting system. Sufficient and timely applications of nitrogen (fertilizer) help to have deeper and healthy rooting system. Grass that is deficient in nitrogen will have a limited root system, which as we have already said, will affect the overall look of the lawn. However, when applying fertilizer, it is also important to note that too much nitrogen will cause excessive growth, which in turn will quickly deplete storage of nutrients in the roots. Now you know, what are the factors that make your grass look all green and soft. Just apply this knowledge and have a blooming lawn all around the year, even in dry season.